Let’s face it, when you have a family your vehicle needs change a little a lot. The two door sports car isn’t as practical as it was back in your single days, now you have to think about things like seating capacity, storage space, and safety. Luckily, there are many great family vehicle options to choose from. Here are five vehicles to consider for you and your family. The minivan market isn’t as popular as it used to be, but the 2014 Toyota Sienna hopes to change that. The Sienna has a sportier look than many other minivans, and it is extremely functional. It can seat up to eight people, and the back seats fold down for extra cargo room. One of the advantages vans have over SUVs is the sliding doors. These make it very easy for passengers to enter and exit the back seats of the vehicle. The Sienna has a ton of available features including navigation system, steering wheel controls, and a dual-view entertainment system for the kids. The Sienna has received high safety marks, and an all wheel drive version is available for increased performance. The Sienna is proof that minivans can be cool again. If minivans’ aren’t for you, check out the Toyota Highlander. Recently the Highlander has been redesigned with a cool new appearance including a bold front grille and available chrome wheels make it stand out against the competition. The Highlander seats up to eight people and has plenty of available features to keep you and your family comfortable and happy including rear seat entertainment, Entune™ Audio, and available leather seating surfaces. The Highlander can tow too! It has a max towing ability of up to 5,000 lbs. If you are interested in a Toyota, you can’t lose with the Sienna or the Highlander. 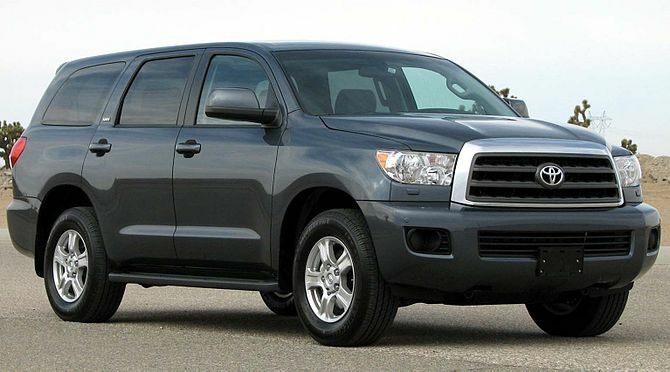 If you need more space and more capability than the other Toyota options provide, the then the Sequoia is a great choice. The Sequoia is bigger and more powerful that the Highlander. It has a fully boxed frame and a powerful 5.7L V8 engine that can tow up to 7,400 lbs. The Sequoia can comfortably seat eight people and comes in multiple models to choose from including a highly luxurious Platinum model. Consumers and critics alike have given the Sequoia rave reviews across the board. If you do a lot of towing, or are just comfortable in a bigger vehicle, try out the new Sequoia. If you would like to see a Toyota near Olympia, Washington visit I-5 Toyota.